In addition to being an engine of misery, corruption, and bloodshed, the War on Drugs should be seen as a multi-tiered criminal enterprise. At the top echelon are found the political figureheads who recite pious bromides. That’s likewise where we encounter the bureaucratic scribes responsible for crafting those cynical pronouncements and the legislation that gives them substance. 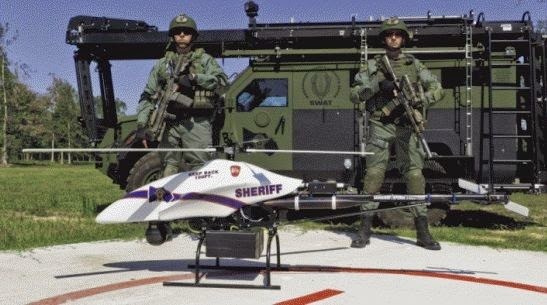 The operational level consists of federally subsidized, hyper-aggressive law enforcement agencies that carry out military-style raids and seizures. This includes squalid undercover police operatives and the petty criminals who act as “cooperating informants,” as well as the strutting armored sociopaths who act on that “intelligence” by terrorizing people in home invasions that are typically carried out before dawn or after sunset. 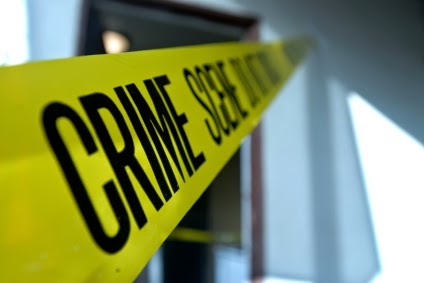 Beneath the lurid violence of narcotics enforcement can be found the gray, undistinguished local bureaucrats who are actually in charge of such task as stealing property said to be “connected” to drug trafficking, caging the people from whom it was taken, and dividing up the spoils. Official transcripts from several meetings of Oregon’s Malheur County Commission provide useful insights regarding the retail-level business of that vertically integrated criminal enterprise. 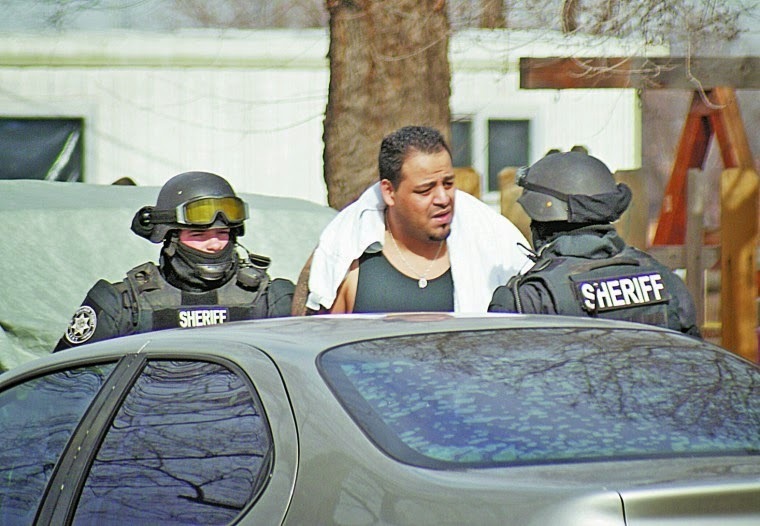 The Malheur County War: SWAT raiders arrest a drug suspect. For nearly two years, the Malheur County DA’s office, working in collaboration with the federally syndicated High Desert Drug Enforcement task force, has been milking revenue out of a September 11, 2012 raid on the 45th Parallel, which was a medical marijuana dispensary located in Ontario, Oregon. Police raids were carried out against both the co-op and more than a dozen “grow sites” in both eastern Oregon and western Idaho. A total of eighteen people were eventually charged with “conspiracy” to provide medical marijuana “for consideration,” under a version of the Oregon medical marijuana law that is no longer in effect. Dugan at a press conference, September 2012. The purpose of the April 9 meeting was to persuade commissioners to continue funding the prosecution of William Esbensen and Raymond Kangas, the co-founders of the 45th Parallel, who were the final defendants in the case. On June 6 they were found guilty in a bench trial of conspiring to provide medical marijuana “for consideration,” despite the fact that the statute under which they were prosecuted was dead-letter law. Interestingly, in an earlier jury trial two other 45th Parallel defendants, Kelly and Kerry Rhoan, were found guilty on two RICO counts but acquitted on “conspiracy” charges. That verdict “kind of makes me cross my eyes because in order to have a RICO you have to have … an agreement to associate, and conspiracy is an agreement to commit crimes,” Dugan recounted to the Malheur County commissioners. Somehow, the only jury that rendered a verdict in the 45th Parallel case ruled that the defendants had created an association to do something that wasn’t considered a criminal act – in this case, to distribute a legally recognized palliative medicine to people who needed it. As it happens, the purpose of Dugan's presentation on April 9 was to entice the commissioners into underwriting what amounted to a highly lucrative illicit enterprise: Prosecuting a RICO case without a clearly established “predicate offense,” through what appears to be a fraudulent county contract with the DA’s office, in collusion with a District Judge who had obliquely indicated her willingness to inflate the charges in order to impose draconian fines that would translate into larger profits for the county. This was explained, once again, during the April 9 commissioners’ meeting. Roughly two weeks later, Malheur County DA Dan Norris reported to the commission that $15,000 from the Sheriff’s forfeiture fund would “contribute to Mr. Dugan’s employment costs.” What this means, of course, is that the money stolen from Mr. Esbensen without due process of law would be used to fund his prosecution on charges filed under a law that was no longer in effect. Norris asked the commission to provide “an additional $15,000 from [the] General fund to continue to contract with Mr. Dugan” and said that he would “generate additional funds needed” to underwrite the 45th Parallel prosecutions, which would cost “a total of $40,000.” How would the prosecutor “generate” the additional funds? Would he hold a bake sale, perhaps? Of course not: He “requested [that] monies from anticipated judgments in the 45th Parallel case be put into the revenue side of his budget” – in other words, that the prosecution would proceed in the expectation of additional forfeitures and fines. Significantly, before the commissioners heard DA Norris’s pitch they were favored by a presentation from Circuit Court Judge Patricia Sullivan. In what one veteran attorney described to me as a clear violation of judicial ethics, Sullivan lobbied the commissioners to provide increased “resources” – that is, funding – for the DA’s office. At the time, Sullivan was presiding over the 45th Parallel case, yet she was advocating on behalf of the prosecution’s budget priorities. Sullivan’s role in the case was also addressed by Deputy DA Dugan during the April 9 county commission meeting, in which he described the relationship between the severity of a RICO offense and the potential windfall for the county. “Now, these assets, other than money that you’ve recovered [sic], I assume you’re taking vehicles…?” inquired Commissioner Hodge. “No, this is all cash, Don,” replied DA Norris, prompting an important clarification from Dugan. As an incentive to carry out additional seizures, Dugan predicted that Judge Sullivan would be imposing significant “compensatory fines” against Esbensen and his partner, Scott Kangas. Getting those judgments would give the DA and the county counsel’s office funding to “do the house and foreclose on the house or do bank accounts, those sorts of things,” Dugan observed. This is entirely true: In the latter case, a legitimate business would simply cut off its useful service from somebody who refused to pay for it; in the former, a privileged extortion ring would kidnap a victim who failed to comply with its demands, and then put him in a cage. Under Oregon law, Dugan continued, sentences are classified in severity “from one to eleven.” As an unclassified offense, a RICO conviction can be rated anywhere along that scale. The pronoun “she” referred to Judge Sullivan, the only female judge in the jurisdiction. By showing up at a commission meeting about two weeks later to lobby on behalf of a budget increase for the DA’s office, she clearly indicated what she intended to do if she had continued as the trial judge in the 45th Parallel case. As it turned out, Sullivan was forced to recuse herself from the case roughly a week after her participation in the April 22 county commission meeting – a development that had interesting consequences for the prosecution during the sentencing phase, as we’ll see anon. The “business” Norris referred to, once again, is a clearly unethical, patently immoral, and arguably illegal enterprise. In addition to its apparent collusion with Judge Sullivan, the Malheur County DA’s office had a dubious contract relationship with Dugan. 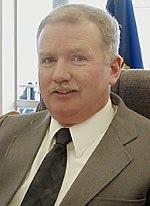 During a February 12 county commission meeting, county administrative officer Lorinda DuBois pointed out that Dugan’s contract “was up December 31st.” This would mean that he had no authority to act on behalf of the county until and unless a new contract was completed – and this was a matter of some urgency, DA Norris insisted, because of “some issues where attorneys in the drug case are seeking sanctions against the Sheriff’s Office and I don’t have anyone working on dealing with that issue. And it’s a time bomb ticking for the Sheriff’s Office. Mr. Dugan needs to be able to get back to work” – which he apparently couldn’t do unless and until a new contract was completed. Or – perhaps he could, according to Norris. “Now, as long as we have a temporary authorization for Mr. Dugan to return to work we certainly can wait until next week to get the paperwork done,” he told the commission. “Is that legal?” inquired County Judge Dan Joyce, who clearly saw a problem in that proposal. “It will be fine,” insisted an official identified as “Ms. Williams,” because “his contract’s going to be backdated to January anyway.” This is because “you really can’t do an amendment; it has to be a new contract from calendar year to calendar year,” she explained. There’s reason to believe that Dugan had expended his allotment of hours before the 45th Parallel trial was over. But that matter is academic if the backdated contract itself was invalid. Although some might regard this to be a matter of petty technicalities, it should be remembered that the defendants in this case were convicted of operating a criminal conspiracy to “deliver” a legally protect medicine in ways that supposedly violated arcane provisions of a medical marijuana law that is no longer in effect. As noted earlier, Judge Sullivan’s participation in this case was central to the prosecution’s strategy. After Sullivan was replaced by Judge Gregory Baxter, Dugan prosecuted Esbensen and Kangas as level 4 offenders. Following their conviction, Dugan asked Judge Baxter to revise – or “backdate,” if you prefer – the offenses as qualifying for level 8 sentences, which would justify the imposition of heavier “compensatory fines” – with the threat of lengthy prison sentences as leverage. Unlike Sullivan, Baxter didn’t appear sympathetic to the financial needs of the Malheur County DA’s office. He ruled that the defendants would be sentenced under level 4 guidelines, which meant two years of probation rather than a prison term. The final amount of “compensation” has yet to be decided, but it will most likely be a less lucrative pay-out than the DA’s office had anticipated – pending additional forfeiture actions, of course. 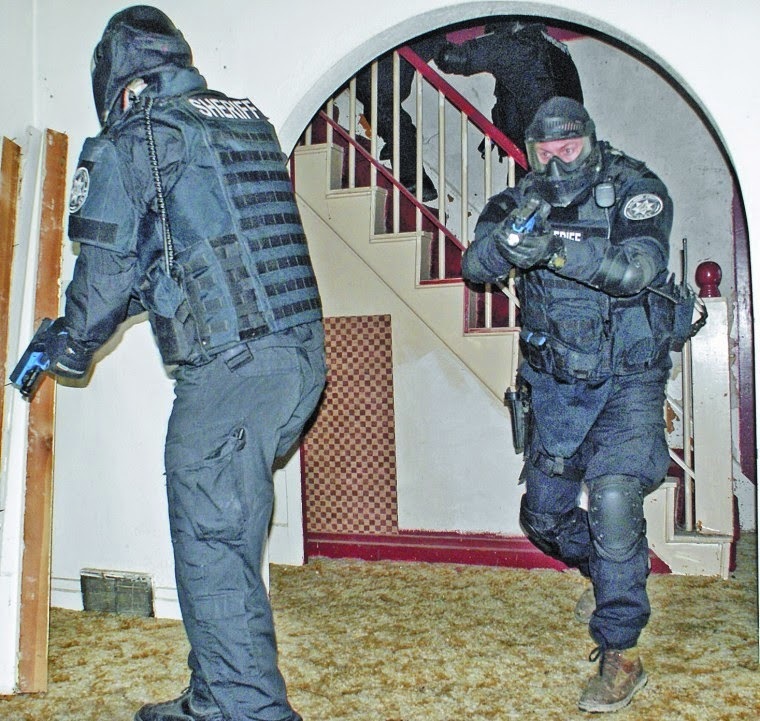 Police state scrimmage: Malheur County SWAT rehearses a home invasion. From teeth to tail, the 45th Parallel case has been a criminal enterprise on the part of the prosecution. It began with the corrupt actions of Boise-based DEA Agent Dustin Bloxham, who committed multiple felonies (including interstate wire fraud and falsifying medical records in order to obtain an Oregon medical marijuana card) during the course of an unauthorized undercover operation on a medical marijuana clinic outside his jurisdiction. One of the key witnesses for the prosecution, Tricia Gardner, is a repeat narcotics offender and serial check forger who continues to operate a medical marijuana facility in Ontario despite a county-wide moratorium. A former staffer at the 45th Parallel, Gardner filed the necessary paperwork to open that clinic on September 10, 2012 – the day before the task force raided the co-op. In November, Oregon voters will consider a measure that would de-criminalize recreational use of marijuana for residents who are at least 21 years of age. As Dugan indicated to the Malheur County Commission, the loosening of restrictions on marijuana use would require updating the local plunderbund’s business plan to emphasize taxation, rather than prohibition. In the meantime, they will have to be satisfied with using whatever means are at their disposal to wring the last trickle of revenue out of Esbensen, Kangas, and their fellow victims of the prohibition racket. The gifted and principled writer Ilana Mercer recently paid me a very high compliment by describing me as "quixotic." Like the noble (albeit unbalanced) Knight of the Sad Countenance, I focus my energies on battles against prohibitively stronger opponents. In my case, the giants against whom I contend aren't windmills. And unlike Don Quixote, I have a family for whom I must provide. I would be humbly grateful for any help you can supply. Thank you so much, and God bless. Go here to listen to, or download, the most recent Freedom Zealot Podcast. 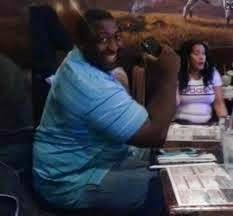 Eric Garner, a peaceful and productive citizen, had suffered years of pointless and unnecessary harassment by the costumed predators employed by the NYPD. He told one of them to leave him alone. Such impudence by a mere Mundane cannot be tolerated, so Garner was murdered in the street in full public view. When a fight erupted in Garner’s neighborhood, the plainclothes officers – who have no enforceable duty to protect persons or property – didn’t intervene. Garner did, according to witnesses, breaking up the fight and restoring peaceful order. 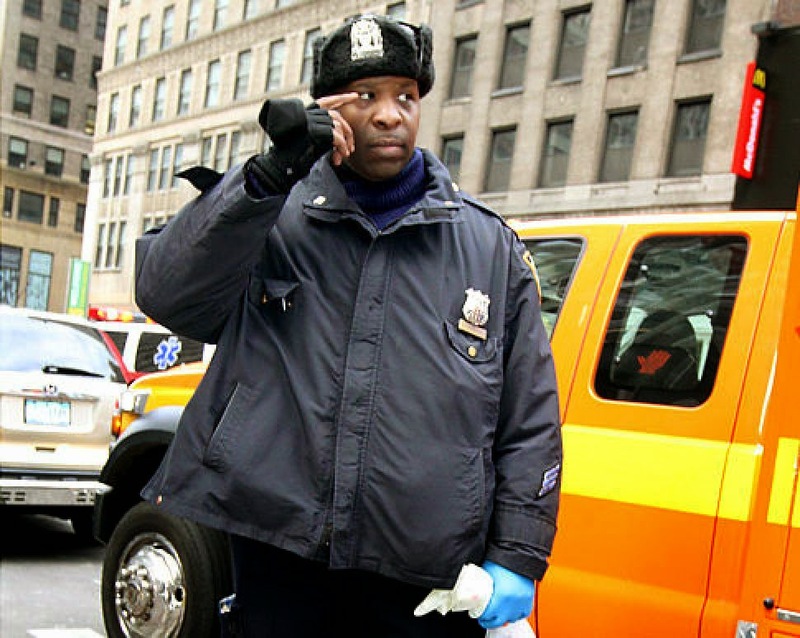 This made Garner conspicuous to the officers whose uselessness he had just demonstrated. The 43-year-old father of six and grandfather of two had been arrested on dozens of occasions and had court dates scheduled later this year for charges of marijuana possession and selling untaxed cigarettes. Even if one assumes – and one shouldn’t -- that either of those charges involved an actual crime, on the day he was killed Garner had done nothing whatsoever to justify being interrogated by the police, let alone arrested. The first fatal mistake Garner made was to act as a peacemaker. The second was to assert his self-ownership in the face of someone employed by the contemporary equivalent of a slave patrol. 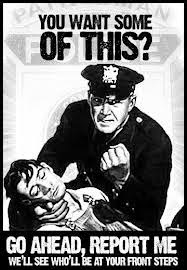 Within minutes, five police officers attacked him, one of them slipping behind him to apply an illegal chokehold. 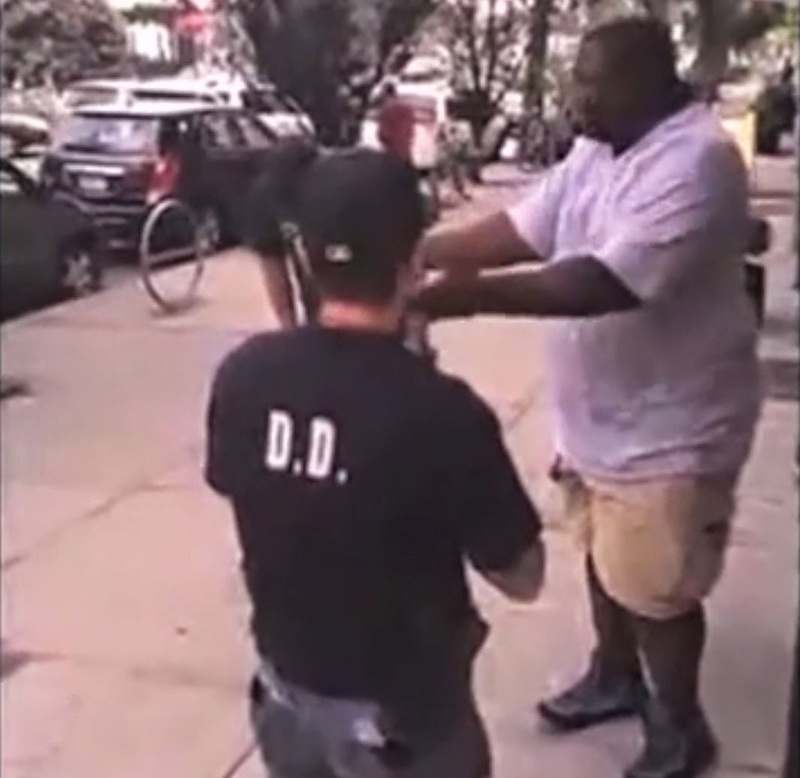 Garner died of cardiac arrest after being swarmed and suffocated in front of numerous horrified witnesses, one of whom captured the entire event – from first confrontation to homicide – on camera. Those who visit the fetid and disreputable social media neighborhoods where police congregate anonymously and express themselves candidly will quickly learn that Garner has only himself to blame. He was an overweight, combative black man who didn’t know his proper place, which was at the feet of his betters, meekly accepting the shackles and submitting to whatever indignities they deemed appropriate. “Anytime a person says `I’m tired of it, it stops today,’ that will almost always end with the use of force,” insisted one contributor to an LEO-exclusive forum. “He made that decision, not the police. The Police must effect the arrest and rise above any resistance” – including verbal resistance to unwarranted harassment by the police, which as Garner’s death illustrates can be treated as a capital offense. 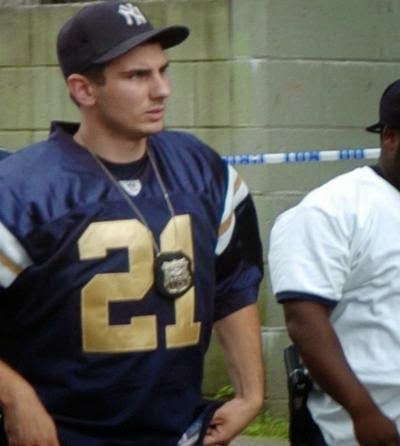 Elsewhere police and their apologists – both paid and uncompensated – are caviling about the nature of the restraint used by Daniel Pantaleo, the officer who attacked the victim’s throat. Because the victim reportedly didn’t suffer significant damage to his throat and trachea, the illegal restraint wasn’t a “true” chokehold, or so the apologists insist. Under NYPD guidelines in place since 1993, this isn’t relevant: The policy explicitly and categorically forbids the use of any restraint involving pressure against the neck or throat. If that statute were applied equitably, as it almost certainly will not be, Pantaleo and his accomplices would be prosecuted for murder. Atrocities of this kind happen every day across the soyuz, many of them generated by the decades-long derangement known as the war on drugs. 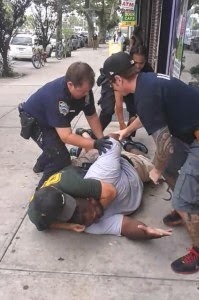 The murder of Eric Garner demonstrates that even if drugs were “legalized,” police would still find ways to kill innocent people while collecting the state’s cut of drug proceeds: Remember, the officers who harassed, surrounded, and eventually killed Garner accused him of selling “untaxed” cigarettes. Three days before the NYPD murdered Eric Garner, New York Governor Andrew Cuomo announced that his Cigarette Strike Force had “seized nearly $1.7 million in cash and contraband” during its first six months of operation. Directed by the state Tax Department, the strike force is a public works project for the coercive sector, encompassing twelve federal and local law enforcement bodies. None of this has even the remotest connection to the protection of persons and property. This is law enforcement pared down to its detestable essentials -- state-licensed aggressors dispatched to harass, detain, and kill people purely for the purpose of revenue collection. The expression “economic crimes” is a Soviet-grade collectivist coinage, and Comrade Cuomo channeled the hell-dwelling spirit of Feliks Dzherzhinsky in expressing his determination to punish those who participate in black market cigarette sales. Or, as the killing of Eric Garner demonstrated, those suspected of violating the “zero tolerance” standard by occasionally selling loose cigarettes will be hounded beyond forbearance and then slaughtered in the streets. Tobacco, like marijuana, is a substance with mood-altering properties. Unlike marijuana, tobacco is legal; another distinction is that tobacco, unlike marijuana, has no known beneficial uses. Apart from a handful of very small jurisdictions, sale and consumption of tobacco have never been prohibited. Instead, the parasite class has expanded efforts to impose “sin taxes” on tobacco: By some estimates, taxes account for more than half the retail price of the typical carton of cigarettes. Over the past five years, as revenue-hungry governments have ruthlessly increased cigarette taxes, the black market has expanded in similar – and predictable -- fashion. 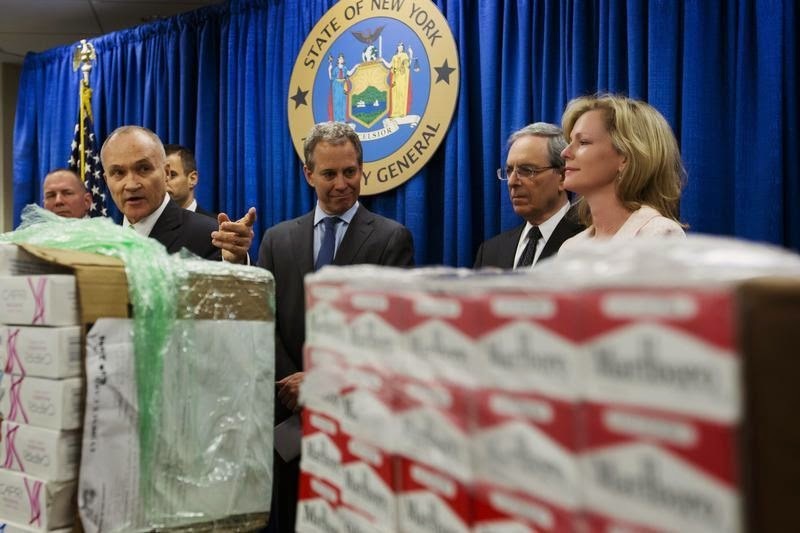 Not surprisingly, New York, where taxes are confiscatory, has the highest “inbound cigarette smuggling rate” in the country, according to the Tax Foundation. Two hundred and forty-six years ago, revenue agents in Boston impounded a large cargo ship christened Liberty that contained a bounty of untaxed goods. The owner of that vessel was a notorious scofflaw and extremist who had been cheating the government by withholding its cut of his commerce. The officials responsible for this seizure acted out of the smug assurance that the “decent” majority would support this righteous assertion of authority. They were wrong. Rather than rallying to the cause of law and order, the population turned against its government, assaulting officers and attacking their facilities. 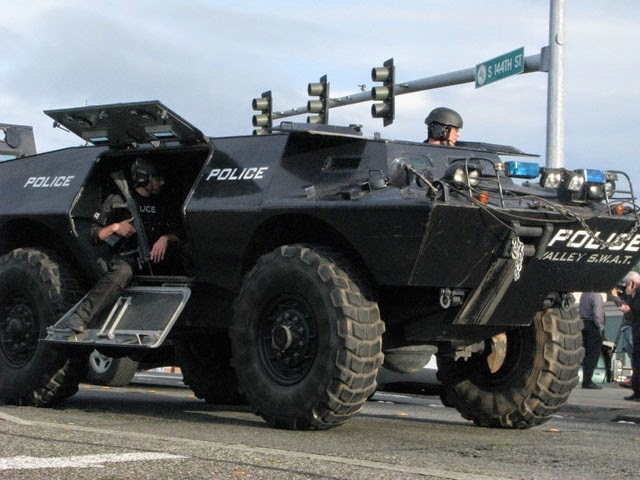 Acting on the principle that law enforcement “must rise above resistance,” authorities escalated their efforts to restore order, eventually sending in the military. This led to a massacre that triggered a revolution in which that same supposedly reprehensible smuggler, John Hancock, would play a significant role. Eric Garner’s exasperated proclamation “It stops today!” is cognate with “Don’t tread on me,” and his murder by an army of occupation immeasurably more vicious and corrupt than the Redcoats could precipitate a long-overdue rebellion against the omnivorous elite that army serves. This is why no effort will be spared to redirect outrage over this atrocity into racial collectivist channels, were it will serve the interest of people who encourage ordinary Americans to look with suspicion and hostility at each other, rather than directing such attention at those who presume to rule the rest of us. Go here to listen to or download my most recent Freedom Zealot Podcast. For an archive of my daily Liberty Minute commentaries, go here. If you can, please donate via PayPal or the Bitcoin button above to help keep Pro Libertate on-line. We're literally struggling to keep the lights on, and could really use your help. Thank you!